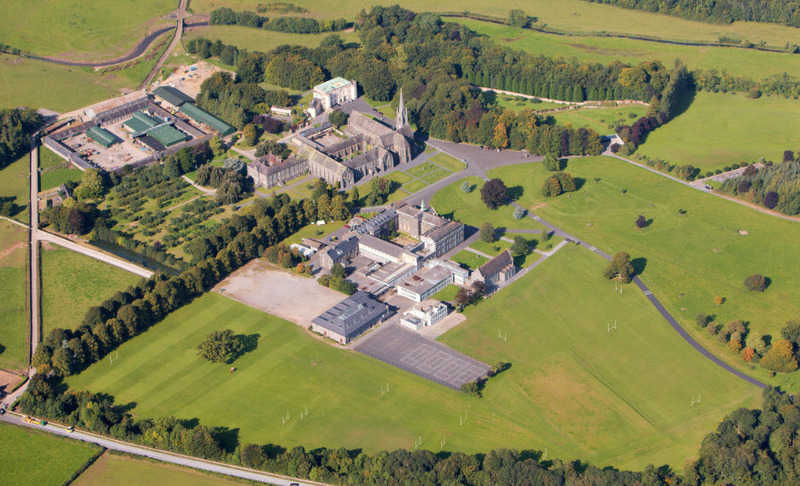 Cistercian Abbey and College from the air. One day in October 1972, less than two months after I started in Roscrea, the Prefect (JB) at our table during dinner started to ask all the 1st year boys what age we were. All the other boys answered "12", but I had just turned 13 so was the "oldest" boy at the table - our Prefect immediately declared that I was "Granddad", a nickname that stuck with me in various forms (such as "Gramps") for the next five years. My brother Brian inherited this nickname when he went to Roscrea for the five years after me. I was also sometimes called "Locka". Not everybody had a nickname, it was almost a badge of honour to have one. Others in my year included: Ball, Thatch, Horse, Chiquita, Taff, Tosh, Masher, Giggs, plus of course many were known by the surnames and abbreviations of same: Hessy, Macker, Ryano, and Noxo. Even our teachers and minders had nicknames: Rubber, Felix, The Rod, The Fish, Padjo, The Rat, Glider, The Bonav, The Mire, and Sparky. It's funny that when us Old Boys meet up we do not use nicknames any more, preferring first names instead. I have to admit that I did not like playing rugby - ever. It was compulsory in 1st year for all of us to play rugby in the Kids' Leagues. I hated it. I was always stuck in the forwards and spent a lot of time pushing and shoving in scrums and rucks. I played most games without ever touching the ball. I was not very good at rugby, and I got hurt a lot with being pushed around and getting savage hand-offs in the face from older and bigger boys from the year above us that we were forced to play against. Sure - it toughened us up and prepared those who went on to play for the JCT and SCT. I was a shite rugby player. Soccer was my preferred game, and "Wembley" was our mecca. The football pitch, beside the solitary tree near the bottom left in the photo above, was like the Theatre of Dreams. I preferred to play in goal and on this pitch I won the FA Cup, the League, the World Cup - pulling off world class saves in every game! Nearly everyone had a favourite English team - Leeds United, Chelsea, Liverpool, and Manchester United were the preferred ones, I was very unusual in that Preston North End were my team. My hero was Preston's Irish goalkeeper Alan Kelly. I played as much soccer as I could, dreaming of the day I would line out in goal for Preston and Ireland. I was a shite goalkeeper, but I loved it. A culture where older boys hit on younger boys would not be tolerated today. While bullying was rare in Roscrea as far as I saw - it did occur. In my previous post I wrote about food - it was common, and accepted, that older prefects had first choice of food at the dinner table, and some abused this position to fill their own bellies while leaving others hungry. I also recall one instance that left me rolling in agony. The corridor between the toilets and common rooms was plenty wide for two boys to pass each other, but in one of those instances where I and another older boy tried to avoid each other by both going left, and then right - the other bully needlessly knee'd me in the thigh to get me out of his way. I thought my leg was broken. Over 40 years later I remember this instance like it was yesterday. Escaping from College was not easy - getting caught led to serious consequences like extra study and writing 100 lines from Lepanto. I was a cowardly shite whose fear of getting caught out-weighed the thrill of "bunking" - most of the time. I remember bunking to Lawler's shop outside the gates of the College - forbidden, but one of the easier bunks to get away with. Bunking Mass was popular, but again the risk was not worth it - Fr Peter (RIP) would not tolerate this, not to mention the wrath of God thrown in. I was in awe of those who seemed to get away with it all the time. Cigarettes cost a lot of money - I could never afford them, and my Mum and Dad would kill me if they found out I was smoking. There was a certain attraction to smoking as it made you look older, and of course you would have been part of the smoking "Saloon" which was the coolest place in the College to be seen smoking openly. I preferred Mars Bars to cigarettes - to me it was no competition. On one occasion, a classmate (Ryano) tried to teach me how to smoke in the toilets. We stood on the toilet bowl and he showed me how to inhale and blow the smoke towards the roof so that The Mire couldn't catch us. While it was exciting to be doing something illegal, I was a shite smoker. During the Leaving Cert exams I managed to get a packet of Rothmans. I sneaked down to the golf course so that I wouldn't be seen and smoked a fag. I was as sick as a dog. I did persevere and was a smoker for about six years afterwards. Mum - if you are reading this it was Ryano's fault! In the days before computers and mobile phones, radio was our connection with the outside world. The Top Twenty on Radio Luxembourg, and Sport on 2 (BBC Radio 2) were my favourite programmes. Every Saturday afternoon I was in Anfield, Old Trafford, Elland Road, and many other Division 1 grounds as commentators like Des Lynam and Alan Parry thrilled us with commentary and results. Saturday afternoon study started at 16:30 - this meant that we did not get the final results. However, I cheated this by feeding my earphone up my sleeve and listening to the results, passing notes to other boys to tell them how their team got on. Radio Luxembourg's Top Twenty was on late on Sunday night, so it meant listening using an earphone (for one ear) in bed. It was a cool thing the next day to be able to not only say what the Number 1 was, but also to have actually heard it. We had to register our radios before study so that they would be taken away from us, but I was addicted to mine and regularly "forgot" to register. It was confiscated by The Mire many times. Is there a reason that you were sent to Roscrea (ie: previous family history) instead of your local secondary school in Carnew? Do you think that as a result of being away for those years you missed out on making friends with local girls and boys? My Dad (Joe) was a boarder in CCR in the 1940s. Three of his uncles were sent there in the years around 1910, his great uncle was one of the founders of the College - so there was a strong family connection. My two brothers (Joe , and Brian) were also sent to CCR. When I needed to repeat Leaving Cert I was sent to FCJ in Bunclody where my sister was a student. One of my regrets is in losing all contact with my classmates from Carnew NS - I envy many of my Dublin friends and colleagues who are still friends with primary and secondary school.